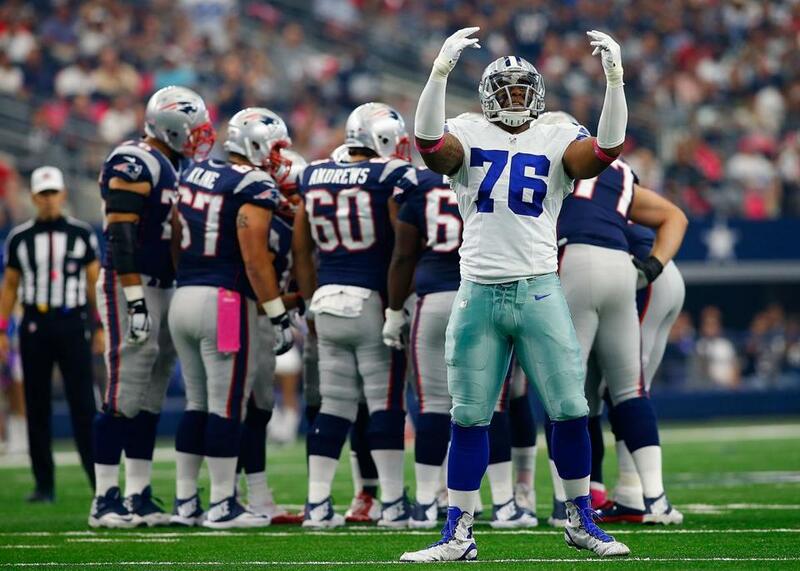 Greg Hardy made a lot of noise in his Cowboys debut, sacking Tom Brady twice. ARLINGTON, Texas — Only one thing managed to stop Greg Hardy on Sunday — asking him about what he had said earlier in the week. The Cowboys’ controversial defensive end, who hadn’t played since Sept. 8, 2014, after a domestic violence incident cost him all but one game of last season and the first four of this one, drew fire nationwide with his comments this week regarding coming back “with guns blazing” and references to Tom Brady’s wife. That subject was not on his agenda after Sunday’s loss to the Patriots. “Any other questions?” was his stock reply. Any questions about how Hardy would perform following his long layoff were answered swiftly and surely when he blew past Patriots left tackle Nate Solder to sack Brady on the Patriots’ second possession. That was only the beginning. Hardy was all but unblockable coming off the edge on the pass rush, recording another sack, forcing a Brady fumble — recovered by Julian Edelman — and decking the quarterback on five other occasions. That part, Hardy was happy to talk about. “Awesome,” he said of getting back on the field. “I’m still excited. I’m excited to be in the locker room with all you guys and all these pictures, just the smell and the aroma. Not always, but today, it is awesome. His teammates and the Cowboys’ fans seemed to appreciate his presence as well. His sacks and tackles were greeted with huge roars, and he clearly reveled in it — though after his first sack, he curiously held his finger to his lips in the “shhh!” gesture. While Hardy claimed he didn’t remember doing that — “It all goes so fast and when you get hit in the head a couple times, it shakes you up,” he said — he had a clear recollection of the crowd’s impact. The rest of the defense felt Hardy’s impact most of all, feeding off his intensity and giving the Cowboys their best pass rush so far this season. Late in the game, Hardy could be seen talking animatedly with defensive tackle Jack Crawford, who had one of the Cowboys’ five sacks, trying to keep him fired up. And clearly, the return of a player who had 15 sacks in his last full season (in 2013) will help the beleaguered Dallas defense down the road. Not enough to beat New England, though, which is why Hardy said he gave himself a grade of “F” for the game. The best part, he said, was just being out there with his team.